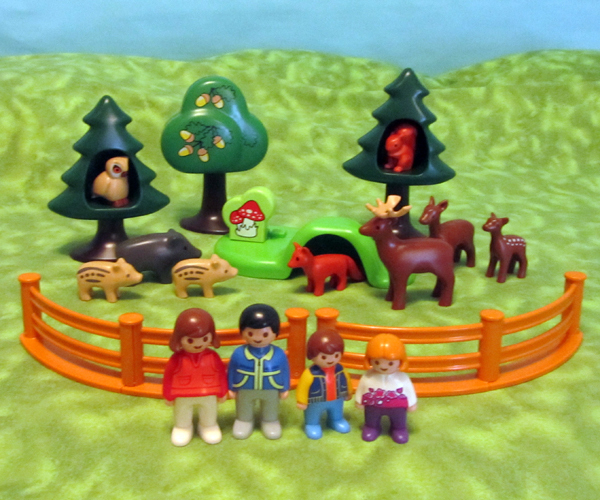 6772 the 1-2-3 Visit to the Forest/Wildlife Park set is a new release in Germany this year. I promised a little review so here you go. The set has a family with Mom, Dad and two kids, and a couple of sections of fence to keep them from having to actually interact with nature. There are 3 trees. Two of them are a new fir/pine tree with an indentation. 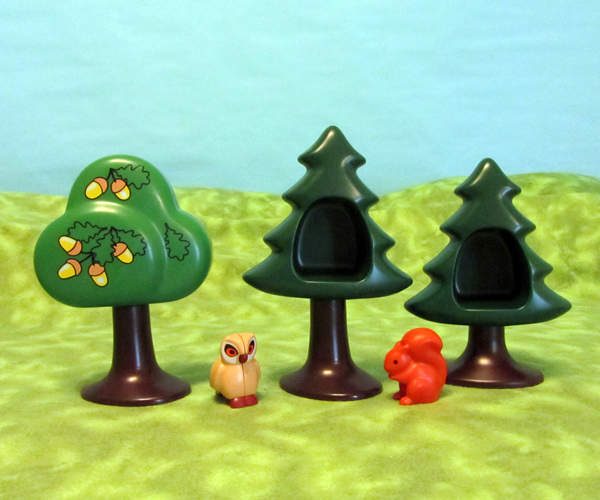 The hole fits the owl and squirrel that are included in the set. 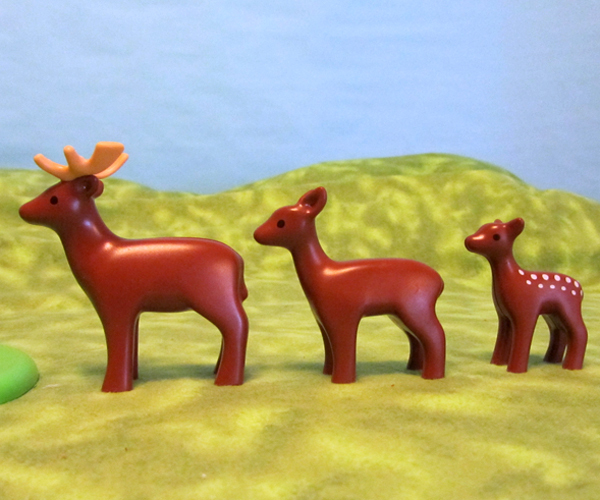 There are 3 deer, a family with buck, doe and fawn. 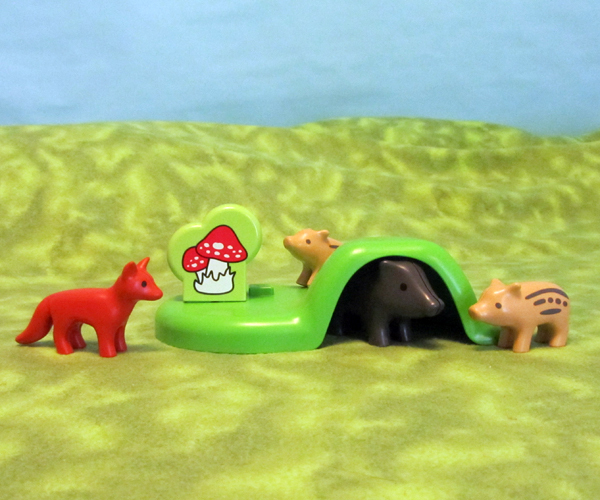 There is also a landscape piece with a little cave space that's just big enough to fit the mother wild pig, and also the fox or baby pigs. There is a mushroom piece that fits onto the square holding pins of the landscape. Also a new piece I believe. All of the animals are new and unique to this set, and the new plants and landscape are also nice additions to the line. With the fence pieces this could be an addition to the zoo series in the 1-2-3 line that has been ongoing the last few years. Overall I think this is a great new set. Plenty of play value and a nice assortment of animals. That is one excellent set! and the animals are just wonderful! Thanks a lot, Tim, now I want it! 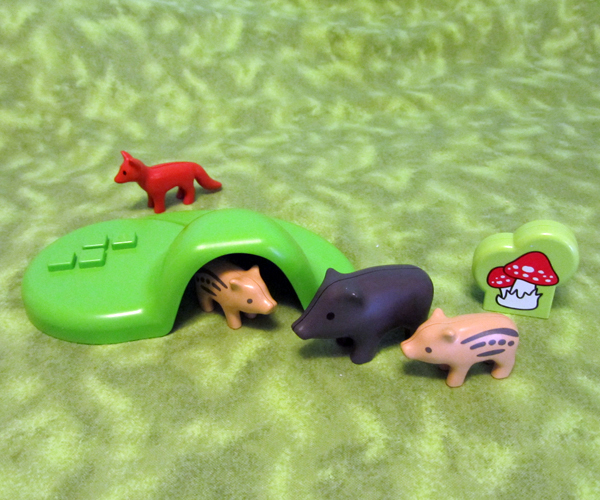 Seriously, I think the wild pigs in this set are just the cutest thing ever! As if the "real" playmo ones weren't cute enough! I'm probably going to break down and start getting some 1-2-3 sets very soon. I feel like getting that set too. The animals are soooooooooooooooooo cute! This is sooooo cute!!! I want one too!!! Thank you for the review and pics Tim! Excellent review, Tim, thank you. These 1-2-3 seem to be getting more realistic in their representation of things and increasingly tempting to add to the collection, or at least to my great niece's collection when she's old enough!